In his first OK Dinghy event, Lars Johan Brodtkorb from Norway won both his opening heats at the 2017 European Championship to taken the lead after the opening day in Faaborg, Denmark. Charlie Cumbley from Britain is second and Andre Budzien from Germany is third. Other race wins went to Thomas Hansson-Mild from Sweden and Anders Andersen from Denmark. After days of incessant and miserable rainfall, the first day of racing looked promising early on with blue skies greeting the 130 sailors as they awoke from the campsite that has been created in the car park alongside the club. The sailors went out on time and after a short wait for the wind to stabilize the first race was sailed in a very patchy 4-7 knots. The huge fleet has been split into four groups, with two starts of two groups, which alternate during the week before a gold/silver split on the final day. Both starts in the first race ended up being black flagged with a few boats pulled out. 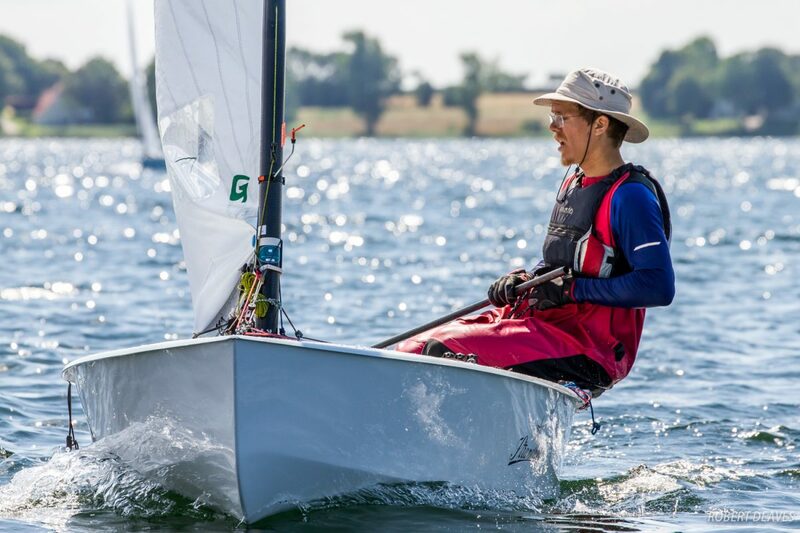 Highlights from Day 1 at the 2017 OK Dinghy Europeans in Faaborg, Denmark. Budzien made the best of the first clear start, tacking at the pin and crossing the fleet. He led most of the way round the first two laps before Hansson-Mild found a way past on the final upwind. Frederik Svendsen came through for third. In the second group, Brodtkorb also started at the pin and led all the round for a convincing win from Cumbley and Marten Bernesand, from Sweden. The wind had dropped to 3-5 knots at one stage, and with the second group mixing with the first group, the wind was further disturbed, but towards the end of Race 1, the wind increased to 10-12 knots and stayed there for the remainder of the day. However it was still incredibly shifty and patchy. Ian Hopwood and Tony Woods of Britain led round the top mark of the first groups in Race 2, with Budzien close behind. Fourth round was defending champion Bo Petersen of Denmark, and he was in the lead by the gybe mark and led all the way to the final upwind, when Andersen played the shifts well to pass him. Budzien was still third, but also fell foul of the tricky conditions on the final upwind with Greg Wilcox from New Zealand just passing him for third. In the second group, Brodtkorb led Jonas Borjesson from Sweden and Tomaz Gaj from Poland round the top mark. Jan Kurfeld, from Germany, one of the many Finn sailors here, sailed well to challenge Brodtkorb on the final upwind and crossed in second, but was one of the early starters, so Gaj ended up second and Cumbley third. Racing continues on Thursday with three races scheduled as part of the 10 race series, which concludes on Saturday. Previous Previous post: Results are ready ……….